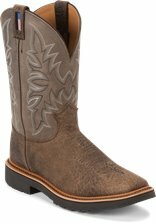 I have five pairs of these boots now and they have out lasted any other boot brand ariat danner Irish setter etc. I put these things through hell in the oil Fields as a rig welder and pipeliner but they just keep on going and they are comfortable to the very end. Thanks for your feedback, James! I am 8 months into these boots and they're still very comfortable. Unfortunately they've begun a rather rapid decent into just another worn out pair of boots in the landfill. Wish they would have been able to go 12 months, on the other hand it's nice to have to replace a pair of boots because they're worn out before they become uncomfortable. I bought another pair that will be at work with me tomorrow. The photo shows a slightly square toe, but my boot has a 3" wide square toe. 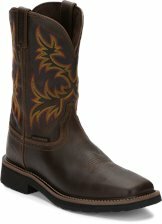 These are not true western style boots. Got these to replace a set of Ariat work boots i wore for about 8 months before they fell apart on the inside. These were less expensive and seem to be lighter weight with the same safety ratings. 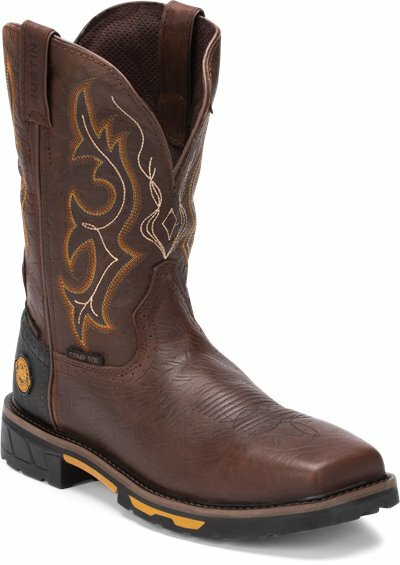 About as comfortable as the Ariats i owned, although ran 1/2 size smaller for me. Ive had these for about a week, if they hold up for about a year i will be happy, most slip-on style boots i have owned only last a year anyways. We bought a pair of these boots, but they lasted only about a year. After we contacted the company and returned the boots to them. They did stand behind the product and shipped us a new pair of boots. I bought these boots for working outside in construction. So far have been very comfortable and durable- enjoy wearing them, and not worried about them getting dirty or scuffed up. Great work boot! I'm a mechanic and I work in a heavily oily environment and the boots just handle it like a champ. Only conplaint is the price and the toe of the boot once ripped the composite toe falls out. But I've been using them for over 14 monthes and they feel great. Justins Foot Stabilization insert technology uses dual density medical memory foam to stabilize the foot while still allowing it to move as needed. A rigid polyethylene heel and instep further increase stabilization. Additional foam instep in the ball area absorbs shock, while a moisture-wicking antimicrobial footbed keeps feet fresher longer. Finally, a toe that meets safety standards without weighing you down. The Composite Safety Toe provides security and comfort, meeting or exceeding ASTM F-2413-11 standards for impact, compression, and Electrical Hazard at a fraction of the weight.